The Wells WVU-96 ventless hood is perfect for electronically powered equipment that still needs a hood to handle grease-laden vapors. This unit does not have to be vented outside, saving you time and money. The air exhaust comes working horizontally but can be fixed to work vertically. You do not have to worry about this hood making your kitchen much louder; it quietly operates at an average 68 A-weighted decibels. With its stainless steel construction, the hood is durable and resistant to minor damage. A self-contained, four-stage filtration system consists of a grease filter, pre-filter, HEPA filter, and charcoal filter to rid the air of common contaminants. Airflow sensors continuously monitor the airflow for removal of grease and ideal performance. A system monitors the filter and will illuminate when it is time to have the filter replaced. If filters are missed, clogged, or if there is a fire, the cooking appliances will be disabled by the interlock system. Wells WVU-96 ventless hood also has a fire suppression system to extinguish fires. Universal Ventless Hood, 96" cooking zone, 4-stage filtration: grease filter, pre-filter, HEPA filter and charcoal filter, electric appliance max. 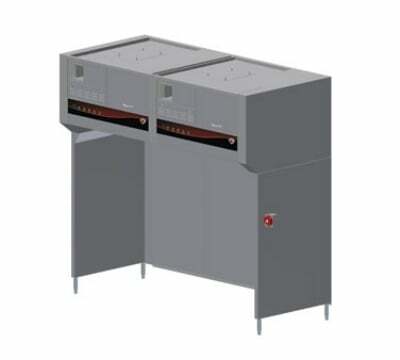 80kw, cUL, US, 208/240v, 13.5 amps, NEMA 6-20R. Stand included.